While he did experience a few nail-biter moments and one mechanical rescue (for a flat tire), the trip itself went smoothly and predictably – a testament to Fandel’s careful attention to detail, pre-trip planning and measured decisions along the way. After chatting with Fandel and reading his notes about his trip, I’d say that his preparation is every bit as interesting as the trip itself. 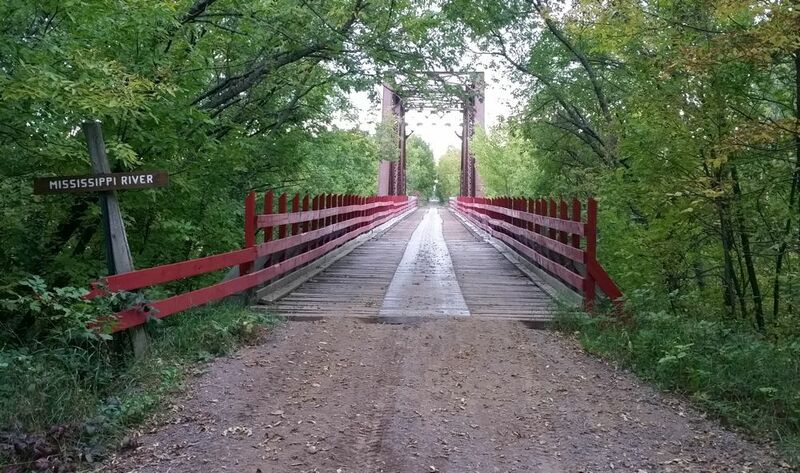 This day included stops in Leonard, Bemidji and Cass Lake running a combination of township roads; county road ditches, forest roads and the Soo Line ATV trail (where some friendly people near Boy River helped with a flat tire). He experienced flat tires on the North section of the Soo Line. And he camped that night in Moose Lake. Exciting moments on this leg included crossing some large downed trees (no option of going around); a section near Bena where he rode on a submerged trail (water going over the ATV's floorboards) for 1/2-mile. Fandel rode the Soo Line trail; State Forest (Nemadji) roads and trails; the Gandy Dancer trail; various trails and forest roads in Burnett and Washburn counties (Wisconsin); plus the Wild Rivers and Tuscobia ATV Trails. Towns visited included Danbury, Minong, Sarona, Birchwood and Winter. He treated himself to a motel that night. Towns this day included Draper, Morse, Hurley/Ironwood, Marenisco, Bergland and Ontonagon via Tuscobia Trail, county roads and various ATV trails in Michigan. 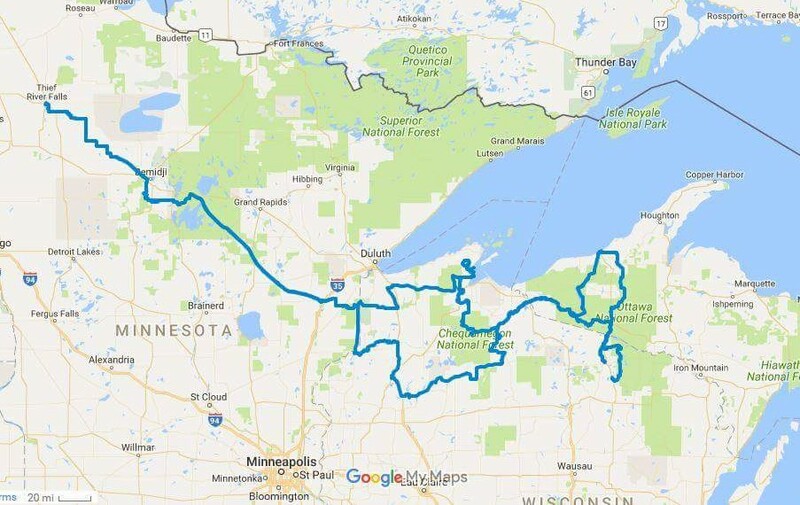 He makes special mention of the Pioneer trail as being especially fun, and the coolness of riding to Lake Superior. He camped this night. Day 4: Rest day in Ontonogan, spent repairing rear tires that had suffered flats. 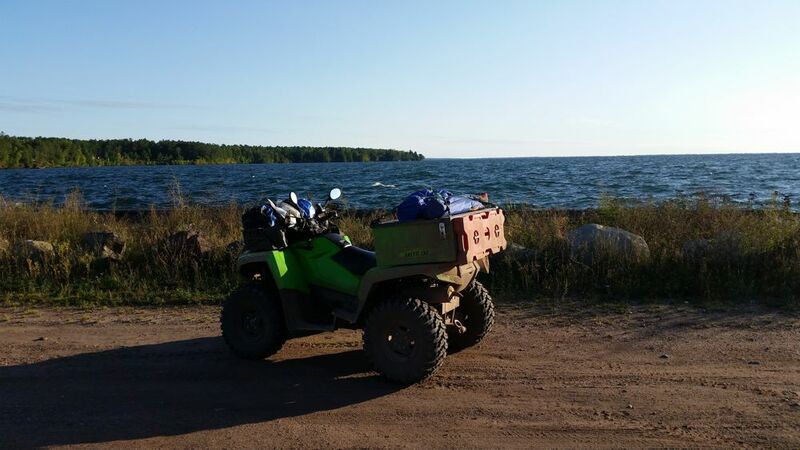 Fandel hit the towns of Paulding and Land O’ Lakes before arriving in Eagle River, utilizing gravel roads, the LL trail and various ATV routes in Vilas County. 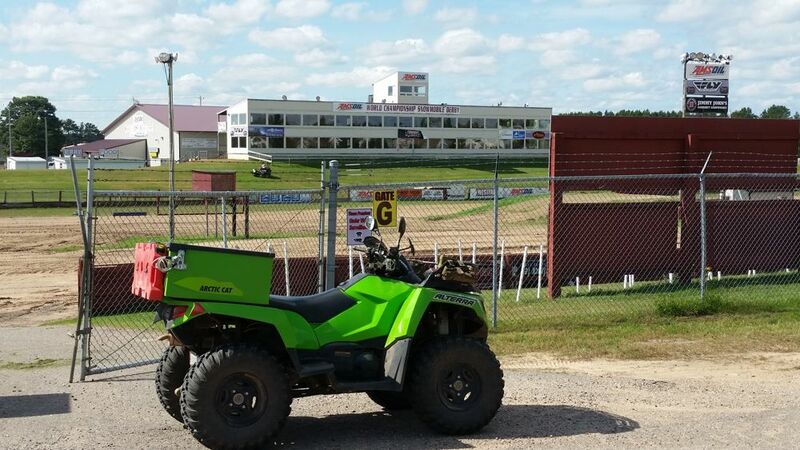 He stayed at the hotel next to the famous Eagle River Derby snowmobile track (photo below). Day 6: Another rest day (doing laundry! ), this time in Eagle River. 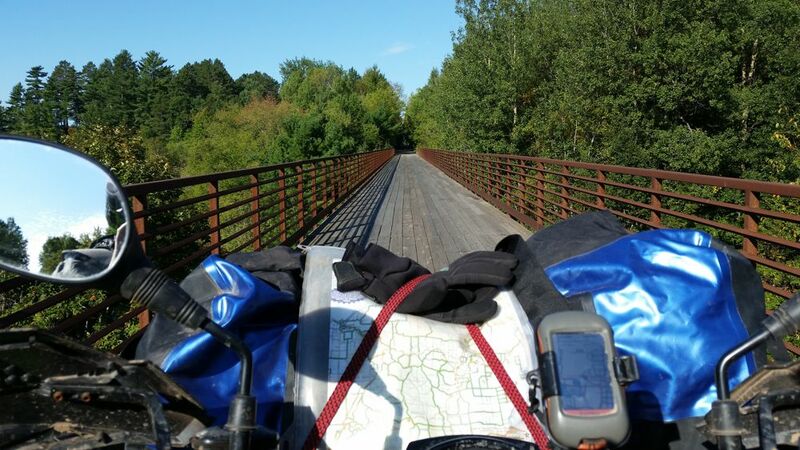 This relatively short ride day was on dirt roads within Vilas County, and stayed at a resort cabin with friends. Days 8-10: No riding, just hanging out with friends at a cabin in Three Lakes. 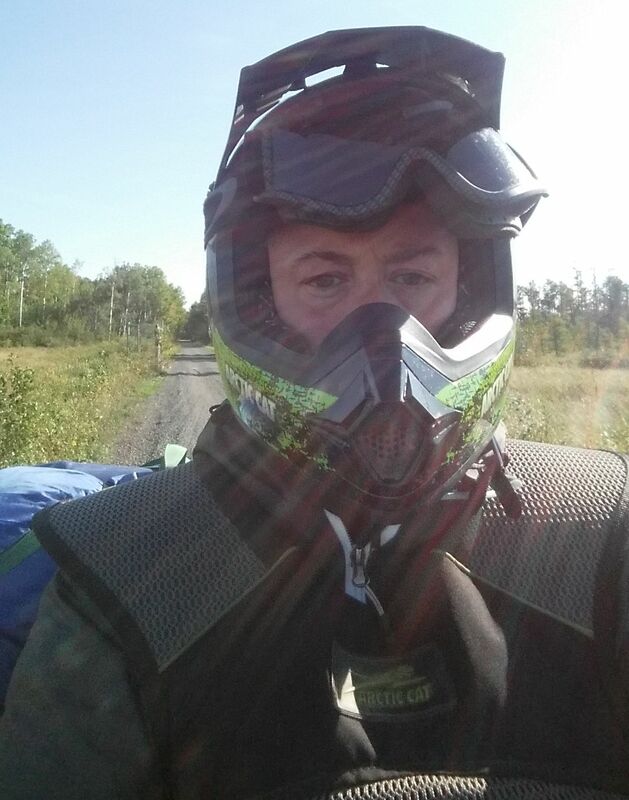 This day saw Fandel riding on county and township roads, plus the LL and IM ATV trails, with stops at Land O’ Lakes and Watersmeet before riding into Ironwood (where he stayed in a motel). 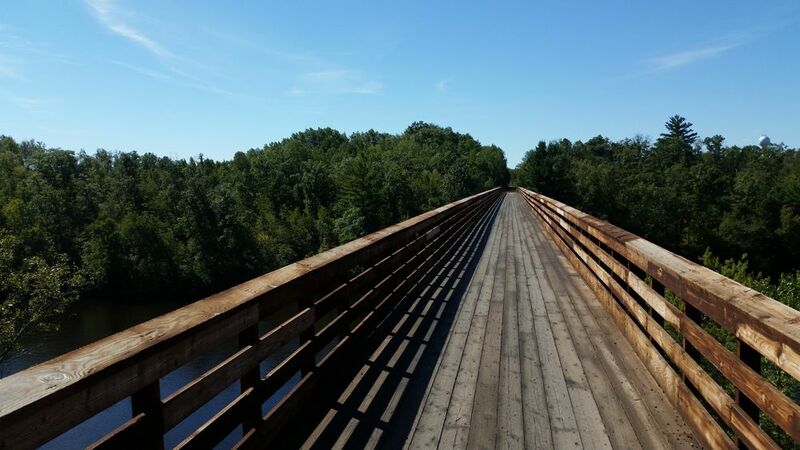 Riding Iron Country trails plus Chequamegon National Forest trails and roads, Fandel rode to Morse and Clam Lake before ending the day at a motel in Washburn. Another night on Lake Superior! The second longest day of the trip, with stops in Iron River, Poplar and Moose Lake. 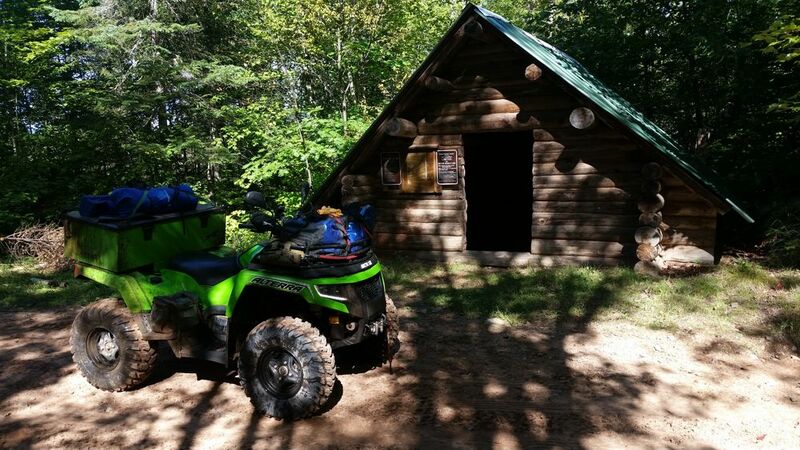 He experienced Forest roads; the Tri-County ATV trail; Wild Rivers ATV Trail, the Gandy Dancer and Soo Line trails; plus county roads. This would be his final night in a motel. 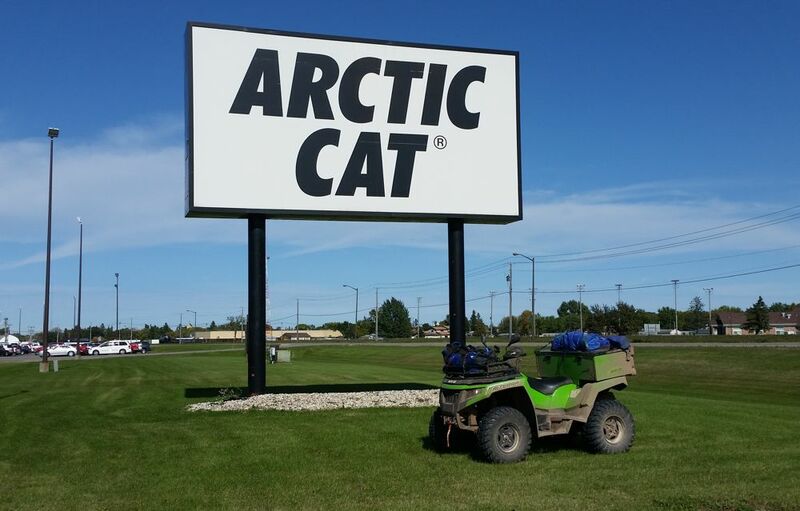 Using the same route he used to start the trip (except in the opposite direction), Fandel had a nice cruise back to his home (with a stop at the Arctic Cat factory sign for good measure) to end the trip with 1,542 miles on his odometer. 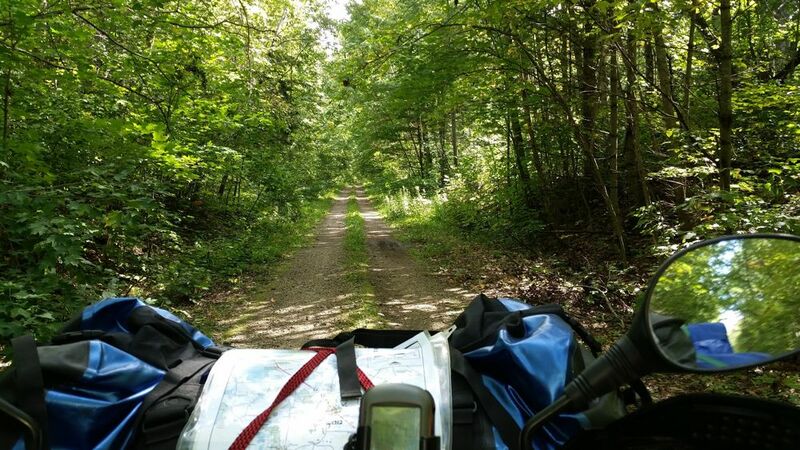 Fandel began preparing for the September trip back in January, by identifying known ATV trails and then how best to connect them via a variety of county, township and forest service roads using a map book and software from VV Mapping out of Michigan (as well as the MI-TRALE maps for the Western UP of Michigan). 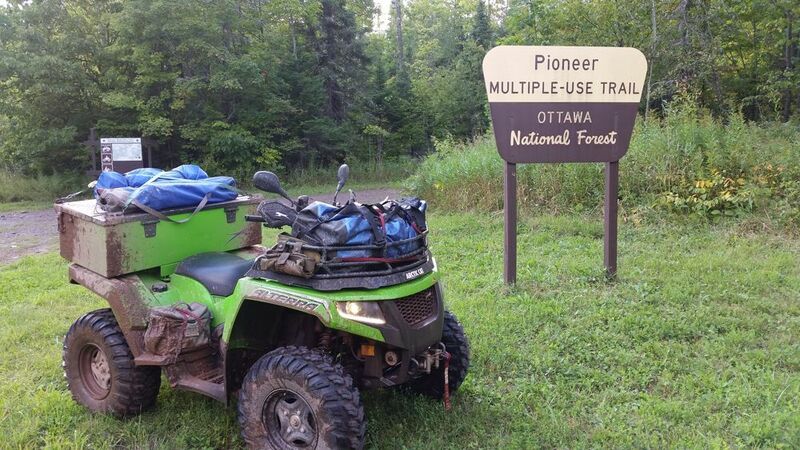 This showed him the legal routes to take, which he then cross-referenced with ATV maps. He searched various local and township ordinances to ensure he was legal to ride his machine into the various towns along the route. In areas where he was unsure what the road or ditch sections held in store, he pre-rode certain segments in the months prior to the trip. While mapping his route, Fandel identified fuel stops, camping locations, Arctic Cat dealers, hospitals and post offices (for delivery drops). Each of these was loaded as a waypoint on his GPS. 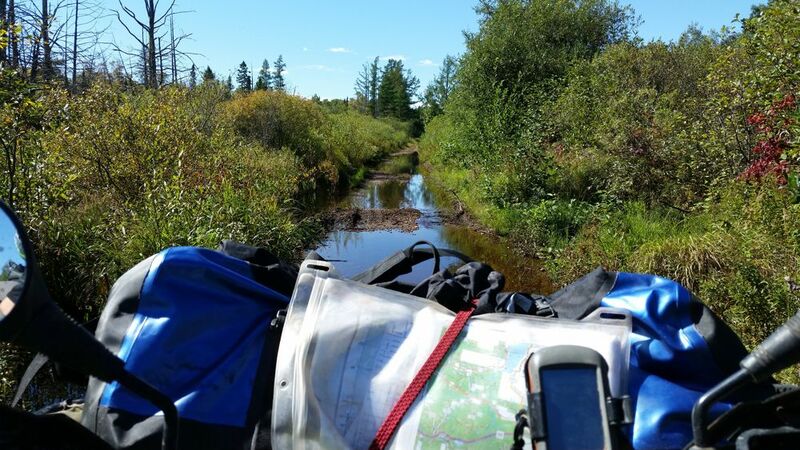 Once the route was nailed down, Fandel had both paper maps (with digital copies on his phone), GPS maps and map books to carry along on the trip. Meal planning was another example of Fandel’s total preparedness. He started by identifying how much food he would need, then used a combination of dehydrated whole meals (spaghetti, chili, alfredo, chicken noodle soup and breakfast mix) that he could quickly and easily prepare along the trail. He didn’t want to take the entire trip’s worth of food at the start, so he packaged up containers that he pre-shipped to various checkpoints along the way. While riding, he always kept 2-3 day’s worth of emergency rations. Fandel chose a 2017 Alterra TRV 700 for the trip because of its large payload, extended wheelbase and comfortable ride package. Of course there were some machine modifications. Because of he expected to run fully loaded at high sustained speeds, Fandel added an oil cooler from a 1000 TRV, plus an coolant overflow bottle (also from a 1000). He went with larger 26-in. tires (compared to stock 25s) for reduced bearing and drivetrain speeds and higher ground clearance. He also opted for steel wheels. Projector headlights from European-spec Arctic Cat ATVs were added for increased visibility at night. Likewise, Euro handlebars had integrated mirror mounting bosses and heated grips. A custom cargo box was fabricated for the trip because the factory accessory box wasn’t yet available. This gave him lockable, dry storage. A rack extension and a Rotopax spare fuel mount were also part of the package. Elka Stage 3 shocks were used to best accommodate the full-loaded machine. 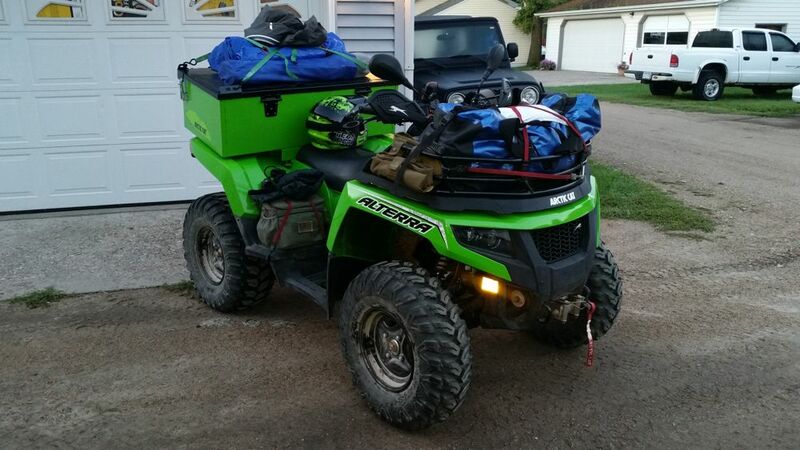 He also added a winch and pull-starter (along with carrying a mini jump-starter). Fandel brought a spare ECU, coil, plug and wire, and a drive belt as added insurance, although he never used any of them. He logged 1,100 miles on it prior to departure (many with extra cargo to simulate what he’d carry on the trip), giving it a thorough break-in. After the break-in miles he performed key maintenance, including an oil/air filter change; differential fluid change; new brake pads; torqueing of all important drivetrain, suspension and chassis fasteners. Planning to camp at least once (as well as have the ability for unplanned-for overnights in the woods), Fandel included a tent, sleeping bag and sleep mat to accompany the tent, towels, stove, kitchen gear and mess kit. He also brought an emergency first aid kit, water purifier, toolset and of course a selection of clothing and personal items, most of which were stuffed into a large dry-bag that was loaded on the front rack. As a nod to his own safety, Fandel rode wearing an Arctic Cat MX helmet with goggles; and TekVest. He also brought a Motorfist Alpine Jacket (with a snow liner), electric vest and Arctic Cat rain suit. “For the distance I was riding and the speeds I like to cruise at, I was overloaded with gear,” says Fandel. “Next time I’ll put the gear on a diet to reduce the total payload by at least 25 percent. In talking about the trip afterwards, Fandel expressed his great appreciation for the fantastic scenery throughout the trip, ranging from wetlands and hills to forests, lakes, rivers, changing fall colors and more. He saw hundreds of wild turkeys, egrets, heron and grouse, but nothing higher on the food chain (although he did see bear and wolff tracks). And the biggest takeaway from the trip? Fandel is already brewing up next year's trip, planning on 2-5 ATVs/riders. He wants to hit more aggressive trails, with more exploration in Michigan's U.P. He's thinking a one-way trip to allow more flexibility and exploration. Soo Line North ATV Trail. Warming shack in the Nemadji State Forest, Gandy Dancer Trail. Ottawa National Forest Road, near Marenisco, Mich. Crossing the Mississippi River on the Soo Line North ATV trail near Palisade, Minn. VERY cool! What an adventure! Thanks for sharing Brian, great adventure ! While ridding how much time did you spend standing up ? Looks like an amazing trip , thanks for sharing! I am a sled nut and not huge into ATV's, however this looks like a blast! Thanks for sharing!